The Best in All the Land: Samantha Dirkschneider lets loose a championship throw at the state track meet. The math may be a little iffy, but somehow Samantha Dirkschneider entered two events this past weekend’s state track meet and won three medals. The first came Friday morning in the discus. The second medal came Saturday morning in the shot put. It would be the eighth state medal in her throwing career, but for the first time it would be gold. After the shot put competition wrapped up, Dirkschneider’s high school career was official finished. But that didn’t mean she was done winning medals. 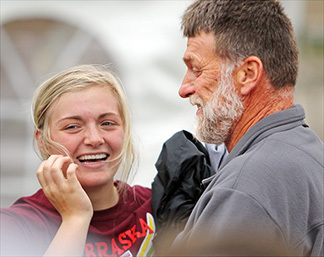 Samantha Dirkschneider beams after winning the Class C shot put and giving her dad Kenny a hug. She also placed third in the discus. She sat around the rest of Saturay as Class A threw the shot, then Class B and finally D, as the best throwers from across Nebraska took aim at her 44 foot, 4.75 inch mark that won Class C.
No one could touch it. At the end of the day, Dirkschneider was awarded a third medal. It was also gold and bigger than the rest. She was the all-class state shot put champion. The journey to shot put gold got a boost from a bronze-medal effort in the discus 24 hours earlier. On her second throw of the discus competition, Dirkschneider produced a throw of 124 feet even. That put her in fourth place, just inches away from both third (124-8) and fifth (123-4). When finals began, no one was improving upon their preliminary marks. Dirkschneider’s first two throws of finals measured 116-11 and 109-7. She was still sitting fourth when she stepped into the ring for her final throw. Instead of concentrating, Dirkschneider was distracted by a song stuck in her head. She may want to find that song and add it to her premeet playlist because it worked. Her final throw measured 130-11 and moved her up into third place. It is the highest discus placement of Dirkschneider’s career after finishing seventh, fourth and sixth the previous three years. Dirkschneider was still riding the high from that last discus throw when she returned for the shot put Saturday morning. She got right to business, as her second throw of prelims measured 42-2.5, putting her solidly in second place. 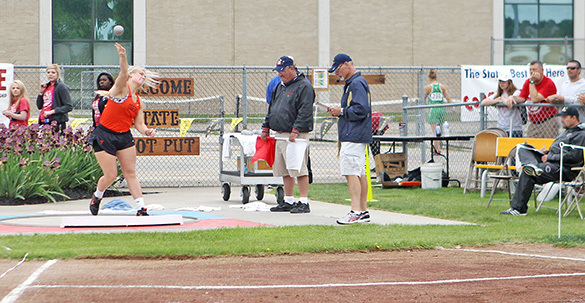 Top-seeded Maria Wortman of Crofton led with a toss of 42-9.75, though that would have been news to Dirkschneider. With her third throw, Dirkschneider erased Wortman’s lead with a put of 43-6.25. Only when the official read off the order for the finals did the NBC senior realize she was leading the contest. In the finals, Dirkschneider did the shot put equivalent of running up the score. Her three throws in the finals were the three farthest throws from anyone in the finals. As the leader going into finals, Dirkschneider was the last one to throw. She tried to plug her ears for the other girls’ measurements, but she heard enough to know that most of the competitors were not improving upon their preliminary marks. Dirkschneider bucked the trend by throwing 43-8 on her second throw of finals. When Wortman made her final attempt, Dirkschneider didn’t see or hear it. As she stepped into the ring for the last time as a high school thrower, a glance toward NBC throws coach Craig Schmeckpeper gave her a hint of where she stood. “I didn’t hear (Wortman’s) mark, but Coach was smiling and shaking his head,” Dirkschneider said. “He said, ‘This one’s for you.’ So I had a feeling. Either she beat me by a lot, or she didn’t throw it. Even with a sneaking suspicion she was already a state champion, Dirkschneider still had unfinished business. She set the NBC school record at 44-7 during her junior year, but her best throw of her senior year had been 43-10.5. She was right. On her last career throw, she broke the 44-foot barrier for just the second time at 44-4.75. As the day wore on, the three other classes took their cracks, but no one could top Dirkschneider’s mark. As it turns out, any one of Dirkschneider’s best three throws would have been enough to capture the all-class gold. She becomes the first North Bend female to win an all-class championship and third overall, joining Mike Settles (1998 high jump) and Jeff Phelps (2000 400 meters).